Kloofing is a variant of hiking which involves mostly walking, swimming and jumping your way down a river. Here in the Western Cape we have quite a few options such as Elandspad, Bobbejaanskloof and Suicide Gorge. 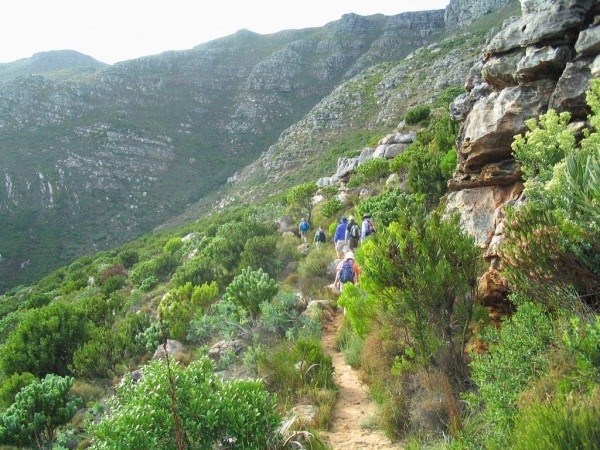 Kloofing differs from hiking in quite a few respects and this article is about those differences. Of course, the main difference from which everything flows is that you are going out to get wet. The whole point of kloofing is to get wet, very wet. And that means that waterproofing is what you need. You need to waterproof your pack in such a way that it will not leak after being thrown into water from cliffs, used as a flotation device and generally submerged in water. The most expensive option but one worth having if you are going to do more than one day’s kloofing in your life is a Sea to Summit Dry Pack. It is worth remembering that no waterproof pack or sack is ever going to last a lifetime. Inevitably friction wears off the waterproof lining. But since most people only kloof once or twice a year, a Dry Pack will last quite a few years. The advantage of the Dry Pack is that it is easy to open and close, requiring no more than a couple of rolls of the top and clipping the ends together. You should also match the size of your pack to the size of your Dry Pack. For serious kloofing (e.g the 5 day Wit Els) you really need to waterproof your equipment very well. In these case using a dual layer is probably advisable. So you would use an outer Dry Sack as well as several smaller inner Dry Sacks. It is important to remember that waterproofing takes up space (there is always trapped air, no matter how well you compress your packs) so take this into account when packing, effectively you must pack less into the same amount of space. This is quite a challenge when you are doing a 5 day trip. Because you are going to spend a fair amount of time in water you will need to wear shoes. Personally I recommend socks as well. The socks prevent water friction and also the inevitable sand which gets into your shores rubbing your feet raw, a most unpleasant scenario. Any shoes you wear should have good traction because in slow flowing rivers the rocks are often very slimy and incredibly slippery (leading to a great deal of falling into water). You can buy shoes with drainage which I have never actually tried out but might be worth a try. Any shoes you use will also suffer an amazing amount of damage so try and use older shoes. I find that when your feet slip on rocks there is quite a lot of bashing of your feet and ankles on underwater rocks so I prefer to wear quite heavy Hi-Tec shoes and socks that cover my ankles and are quite thick. The wet socks do weigh your feet down but I find it a small price to pay for protected ankles. Boots are not a good idea for kloofing as they are too heavy. For clothes wearing a swimming costume and tshirt is fine. I wear a hiking synthetic tshirt (a First Ascent Duoflo) which I find drains and dries very quickly. (For scouts, have a look at the HiTec factory shops like the one in Access Park in Kenilworth. HiTec factory shops are relatively cheap and scouts get a 15% discount). Cotton shirts are probably the worst option as they retain the wet and a light breeze will quickly chill you when you are not actually in the water. You can still kloof in one but you might want to take it off at lunch time so that you are actually warmer. Be sure that your costume will not rub as you will be walking in it all day. Board shorts are fine. There are a couple of safety rules in kloofing. 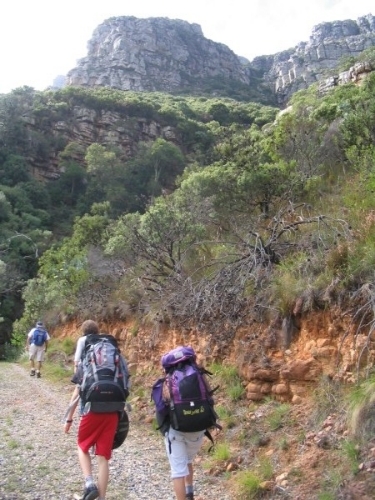 The first thing to understand is that kloofing, like hiking, is inherently a risky thing to do. Accidents are fairly rare but they do happen. So have a good first aid kit and make sure that at least two people in your party are trained in first aid. As scouts we should also play scenario’s, the “what if” so that if the “what if” does happen you will have a good idea of what actions to take. Don’t wait for the accident to happen to you, be sure you have an idea of what the correct actions to take are when an accident does happen. 1. Never, ever dive into a rock pool. Always, always jump, feet first. Broken legs are very different from broken necks. It is impossible to judge the position and height of rocks under the water and you can easily hit your head on a rock if you dive. I personally know a person to whom this happened; he is now a quadraplegic. 2. Never do a jump until you have assessed the pool underneath; by which we mean climb down into it and make sure there are no underwater obstacles. Often there are shallow rock shelves to one side or the other (A good example is at the pool at Die Hel in the Groot Winterhoek). Jumping onto these is a good way to spend the next few weeks in hospital. There are exceptions to this, as in Suicide Gorge where there is no option but for most kloofing, someone needs to climb down and make sure. Also remember that rivers move so what is fine one year is not necessarily fine the next. If the jump makes you too nervous, don’t do it. 3. Always have a first aid kit and know how to use it and what you will do if something does go wrong. 4. Make sure you can swim. 5. Don’t let your party string out. It is easy for the last person to slip and fall without anyone noticing. Always and continuously make sure that your party stays together and you know where everyone is. 6. You are going to spend a lot of time in the sun and get a lot of reflected sun off the water. Wear a hat and use sunblock often. Sylvasun is great a helping to prevent sunburn although it will not stop you burning so you need to use it in conjunction with sunblock. That’s the basics of kloofing. Enjoy!! 1. Your going to be on that base with the same people for ten days so make friends. Also talk to them a lot they can sometimes help you out with certain things like when i stayed i met someone who is now going to help me get involved with warhammer. 2.Work out where your going to be and figure out what you will have like nice bathrooms or huts. 3. Pack comfortable trust me you dont want to be stuck in the middle of the cederberg and be uncomfortable. 5. Try and get some experience of what you will be doing. The Petzl Tikkina 2 headlamp is a little gem in the world of headlamps. If you are looking for a sturdy, cheap quality headlamp for hiking then this one must be in your short list. It only has two settings – bright and energy saving. The bright light throws a beam an acceptable distance while the energy saving setting is actually better for cooking and similar functions since it gives a wider dispersion of light. The Tikkina 2 doesn’t have the flashy stuff like flashing lights and red LED’s. What it does provide is simple effective light which lasts a long time. The headstrap is easily adjustable and comfortable on the head. The switch is easily available. As one whose formative years as a hiker was with conventional handheld torches (no headlamps in those days) the use of this light is simply wonderful. You probably can get better lights than the Tikkina 2 with more options and maybe longer life but the choice will largely come down to hiking philosophy and the cost. For me hiking equipment should be simple and sturdy. Extra functions should serve a real purpose. The Tikkina 2 fulfills all the criteria I need from a headlamp. It costs R159 from http://www.iwarehouse.co.za/ ; R189 from http://www.outdoorwarehouse.co.za and R175 from http://www.capeunionmart.co.za. Orange Kloof is the huge kloof lying above Constantia Nek. You get a good view of the kloof from the ridge on the Vlakkenberg (see here for a description is this route). Orange Kloof has not been burnt since 1935 and up until pretty relatively recently was a no go area for the general upblic. It is now open to parties of 12. A permit must be obtained from Sanparks and you should be aware that the rules around this number of 12 are inconsistent, depending on who you are talking to. The word on the permit are also inconsistent with the information we were given. We went up in April 2012 and the weather was somewhat cloudy which both detracted from the view and made it more interesting. Unlike most routes we did not do a circular route but exited at the Woodhead Dam and stayed over at the SMC Hut. This also took explanation to Sanparks who initially struggled to grasp the idea. Our guide was Mark, who was very interesting and helpful. We left from Constantia Nek at 12.30 and walked along the road, passing the Waterworks housing on the left. 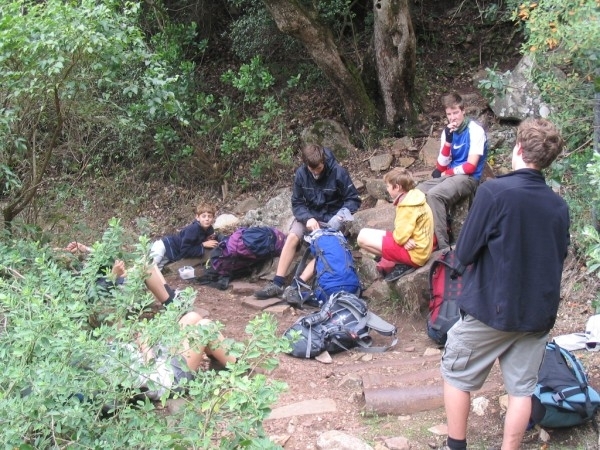 Mark stopped quite frequently to explain aspects of the history of the Kloof and plants to the scouts. After about 2 hours of walking on the road we stopped for a break, more or less at the highest point. Further up and after some twists in the kloof the Woodhead Dam wall reared itself up above us. The foot of the dam wall is heavily overgrown with brambles and an approach to the foot can be quite a painful experience if you are not careful. After a few minutes at the wall, we walked up to the top via the path on the left. We reached the top at 4pm so the total hike was 3.5 hours with quite a lot of stops along the way. Mark left us at this point to go down Constantia Nek and the scouts headed to the SMC hut for the night. The second day we had planned to hike across the top of the mountain to Maclear’s Beacon, visiting some of the valleys but the weather was entirely unco-operative giving us whiteout conditions for the whole day. As a result we spent the whole day in the hut, playing cards and hoping for the weather to lift. Vain hope! On the third day the clouds lifted at about 9.am and we just had time to clean the hut up and do a quick side trip into the Valley of the Red Gods and Isolation Valley before turning and doing a high speed descent via Woody Ravine. To reach Woody Ravine we followed the 12 Apostles track past the top of Kasteelspoort and on to Woody which is marked dangerous. Ignoring this sign we went down, encountering a great many blister bushes close the path in the upper reaches. Woody Ravine is a short (1 hour) sharp descent which has the advantage of being relatively sheltered from the wind (north west on our descent) while Kasteelspoort can be a bit more exposed. 20 minutes walk from the bottom took us to Theresa Avenue and waiting parents. Check out the Orange Kloof gallery here to see what it was like. We did this day hike in reverse direction to most descriptions which start from Constantia Nek. Instead we started from East Fort just before the toll plaza on Chapman’s Peak drive. We left one car at Constantia Nek as this is not a circular hike. We left from East Fort at about 8 in the morning on quite a cold day. The route lies behind the old ruins. Unfortunately the descriptions for all these ruins have been stolen. However they are the barracks and command post of the East Fort itself which lies below the road. Behind the ruins is the road going up. We followed this road up the side of mountain. You get great views of Hout Bay spread out below. You can also see the remains of the old jetty from which the manganese ore used to be shipped. There is no truth in the urban legend that the first load of ore went down the chute and straight through the bottom of the ship. However, the ore did get out of control when going down the chute, one of the reasons for the shortlived nature of the mines. On the way up on the extreme left turns of the road you can visit the mines themselves. It is now quite overgrown and the best indicator of the location of the mines is in fact the rusting barbed wire on these left turns. On the first one, additionally, pine trees have fallen down across the path. The mines themselves are about 100m further out from the left of the path. Further up, if you walk to the left of the path you will see a single strand of barbed wire which marks shaft 4. Having missed the first mines we went to this one and crawled into it. The mines are supposed to be safe to crawl into but ultimately a hole in the ground always has risk. After this we were shortly at the top where we found, to the left of the path, another mine, marked by an ore dump. There is nothing to show that there is hole in the ground here so proceed with caution, especially as there is a lot of vegetation growing out of the mine. After this we proceeded along the path towards the “nek” which is clearly visible in the distance. On our right the Constantiaberg loomed over us and to our left Hout Bay gave an everchanging vista. Thick fields of protea’s and some very active sugarbirds can give a real feeling of being out in the wild, despite the presence of houses only a short distance away. The path heads into a kloof and then curves round again towards the nek. Once over the nek there is short path until we reached the tar road up to the Constantiaberg radio mast where we took a break to watch the mountin bikers shooting down the mountain. We reached this spot at about 11.00 after fairly lengthly stops at the manganese mines. We headed down the road for about 100m and then turned left to head down in the Bokkemanskloof. The path down and up the other side is clearly visible. Usually the bottom of the valley where the river runs is very windy and it is not advisable to stop here. We stopped for a very early lunch on the way up the other side. After that break we proceeded up the slope and headed towards Constantia Nek, stopping to admire the outstanding view of Orange Kloof. This is one of the locations where one can truly appreciate the scale of Orange Kloof. The descent towards Constantia Nek is around the Silvermist Estate, which means a lot of walking down steps (which are not going to last much longer) and then between fences to the exit at Constania Nek. We reached the end at about 12:30. 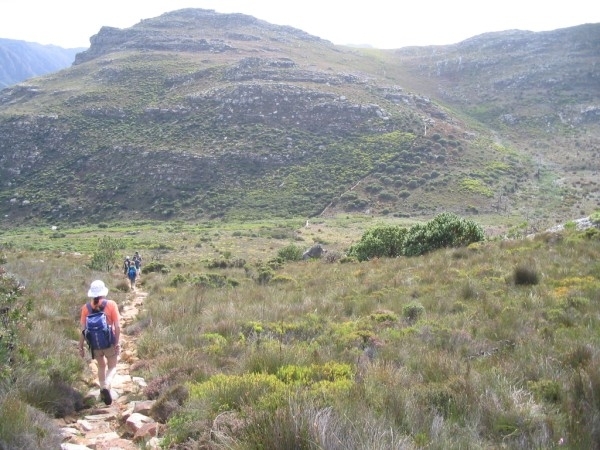 We hiked up Elandspad in 2012. The full set of photos are in the photo album on this site under the 2012 Album. Permits must be obtained from Cape Nature and parties are limited to 12. The Piscatorial Society also has the right to grant permits to trout fisherman in this area and it is likely that you will see some of them on the lower reaches of the river. Elandspad lies just on the other side of the Hugenot Tunnel and because of the steep sides of the kloof it is better to start this hike early in the morning so that you can finish while there is still sunshine. This is especially true if you are planning to kloof down the river itself as the last swims are likely to be in shade at the end of the day. 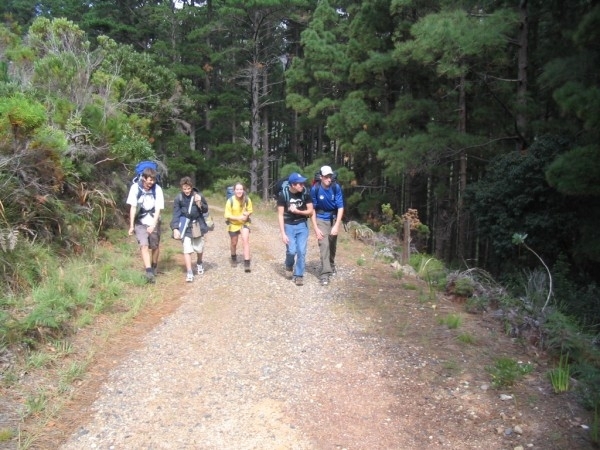 This hike is suitable for most reasonably fit people but the full day can be quite demanding so if you are not reasonably fit or have younger children with you, consider either splitting the party into two or taking some the easier options. The youngest scouts with us were 11 and they were very tired at the end of the day. We arrived at the start point at about 7am on a hot summers day (about 28C). The parking place has been moved from where it was a few years ago so that you now have to drive someway past the exit to the Tunnel on the Worcester side and turn off on the left side down to a parking place. There is signage so it is best to go slowly and not be hassled by traffic behind you. To get to the start of Elandspad you go through the stile and follow the signs, passing under the bridge and entering the kloof quite high up on the side. The well defined and marked path leads up the side for about 1.5 hours. You get some great views of the kloof with the river meandering on below you. Eventually the path will lead you down to Fishermans cave. Camping here is banned and fires are definitely banned. The other side of the kloof was still recovering from recent fires and more fires in the next 10 or 15 years will probably result in local extinction of some plant species. At this point you have two options. As both of them will result in you getting wet, this is the time to waterproof your packs and be ready to get wet. The first option is to keep moving up the river which can be partly done by sticking to a precipitous and quite overgrown path on the side of the river or you can drop straight into the river. Either way, after a bit you will cross from the nature reserve onto private land. You should not actually enter the private land although we did not go far enough up on the day we were there to encounter the limit of the reserve. The kloofing upriver is very easy going. After about 45 minutes we turned around and went down to go for option 2. Option 2 requires a high level of fitness and tenacity but does have the benefit of a spectacular waterfall at the end. If you have children younger than 14 with you, they will definitely require help to get over some of the obstacles. 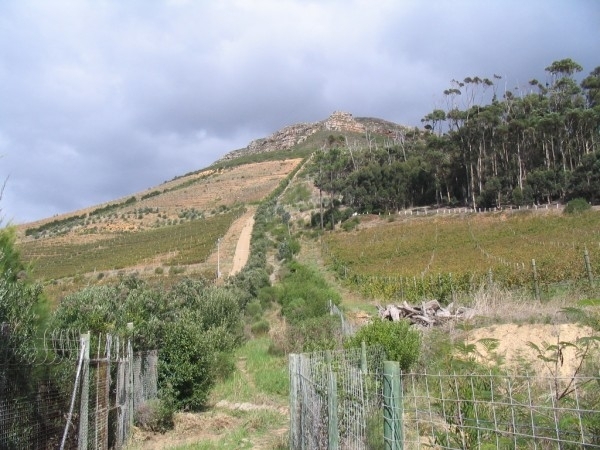 Further, the kloof is so narrow that it often get no sun in the day at all. This makes it very cold, even on the hottest day, so it is suggest that you either limit your stay at the waterfall (remembering that you will be somewhat wet) or have warm tops you can put on. A little above Fishermans Cave and on the other side of the river is a tributary which cascades down from higher rocks into the main river. To get to the waterfall you will need to follow this river up. Initially we found it best to hug the side of the kloof and and follow a rough path up. Once the sides became too steep however we were forced into the kloof itself and it took about 1.5 hours to negotiate our way to the waterfall. Care must be taken for many of the rocks are very slippery and it is very easy to slip. Further, in some places, you must climb up waterfalls and a fall here can result in severe injury so mutual assistance is very important. The waterfall is one of the great sights of the Western Cape and hardly known at all so take some time to appreciate the sight. You can swim in the pool and there is a geocache in the area, on the right of the waterfall. We stayed over at the waterfall for a quick lunch but by the time we left we were all very cold and happy to head downstream. The route back is actually easier than the route in and takes a bit less time. We hit the main river at about 2:30pm and started downstream to kloof our way right down to the bridge. An alternative is to exit the river at this point and take the path back. The kloofing down stream is not particularly spectacular and there are lot of slippery rocks so it can be quite funny to watch people falling over in the water for no apparent reason. This type of kloofing is best with tackies (with good grip) and socks to stop the river sand causing friction between your foot and the shoes. Sandals are not a good idea as you toes are likely to get bashed at some point. The closer you get to the exit point, the more mandatory swims there are. Chances are you will have got to this point as the sun leaves the water, making the swimming very cold. Waterproofing your pack at this point is also very important as very poor waterproofing will mean you packs will be very heavy. Less fit members may really be struggling at this point and it is essential that the group sticks together and offers encouragement and support. You finally exit the river just on the other side of the bridge (we got there at about 4.30pm) and scramble up a steep slope to the level ground. It is also possible to continue down the river for a short time and exit further down. Either way you head back to your cars, dry clothes (heaven) and something to drink. It is an hours drive back to Cape Town.